Free Printable Avengers Birthday Invitations. Free Printable Avengers Birthday Invitations that you can use to invite all your friends to help The Avengers Assemble for a Birthday Party. 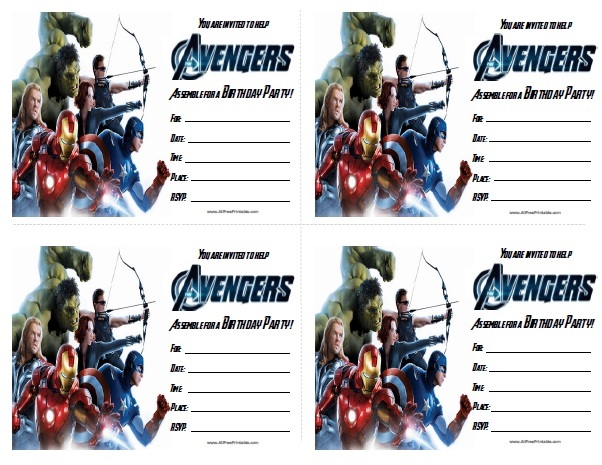 You can print and use the Avengers Invitations for your next Birthday Party celebration and save some money for decoration, treats and gifts. The kids want to see the new Avengers movie, but first let’s celebrate a birthday party. Print the Avengers Birthday Invitations using your inkjet or laser printer with card paper and cut along dotted line. Then write for who is the party, date, time, place, RSVP. Includes a Avengers theme characters Iron Man, Thor, Hulk and Captain America. Download the Avengers Birthday Invitations with 4 invitations per page.